The average home owner is starting to require the need for a chainsaw more and more in 2018. Whether it’s to cut back some branches or help remove trees that have fallen over from a storm. It’s very hard to deny that more people every year are going to start requiring a chainsaw. So what makes for the best chainsaws for home use in 2018?. I believe this is a great thing since I believe most people should own a chainsaw no matter what, you will never know when you will need one. This does bring up some difficulty for people who have never owned a chainsaw and want to know just what is the best for their home. This is can be an overwhelming question since there is so much to learn. This is a question that I’ll be able to answer for you while also keeping a tight budget in mind. A lot of places will just recommend the most expensive units on the market, which I don’t think is the right thing to do. Sure those expensive units are great and will easily get the job done. But does the average household owner really need a chainsaw that cost over $500?. The average home owner won’t need such an expensive unit, and getting one most likely will end up being a waste of your hard earned money. I know first hand as I’ve paid top dollar for many items that simply sit around and collect dust these days. So what I hope to achieve on this page is to give you accurate reviews on what I consider to be the best chainsaws for home use. 1.1 What Size Chainsaw Do I Need? 2.1 What Makes The GreenWorks A Good At Home Use Chainsaw? 4.1 How Long Is The Battery Life? The very first thing you will need to work out is what kind of work needs to be done on your property. Are you only going to be removing branches from overgrown trees, or cleaning trees and removing limbs. If those are what you need to do then I would recommend an electric chainsaw, with the use of a heavy gauge extension lead. These are generally cheaper units that will provide the power you need to make short work of those tasks while offering room for greater power if required. If you need to go further then your leads will allow you, will have the option to go with a battery unit which will be a little more expensive. But you don’t have the drawback of the lead. If it’s your first time using a saw, then this is perfect for beginners. If you will be felling trees weekly then I would go with the much heavier duty gas powered chainsaw, since these units typically have more power and are more designed for this task. The downside is that they do cost a little bit more which is understandable, but if this is the task you need to do then there really isn’t any other option. The next thing you will need to work out is just how large the trees you will be cutting. While also understanding how much experience you have with operating a chainsaw may lead to what size chainsaw you buy. The reason these two things are important is because they will decide what size bar chainsaw you will need. If you’re beginner and have never really used a chainsaw before I would recommend using a smaller model between 8 to 18 inch bar, unless the task you require needs a larger bar. If you’re going to be cutting large logs for either feeling a tree or firewood, you will need a bar that is between 12 to 24 inches. 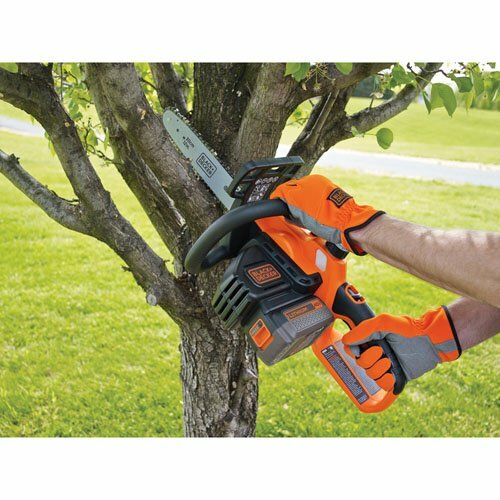 So overall if you need to do some light trimming, pruning, and removing of small tree limbs then an electric chainsaw with a bar between 8 and 18 inches will be plenty for you. If the task you need done is either cleaning up some medium sized trees then a battery or gas powered chainsaw with a bar of 16 inches plus should get the job done. And if felling large trees and cutting logs for firewood is what you need done, then a heavy duty gas chainsaw with a bar of 18 to 24 inches is what you need. Don’t be fooled by the price of this unit as it’s quite affordable, yet boasts some pretty cool features. For a 14 inch bar chainsaw, it’s an impressive little unit that packs quite a bit of power with its 9 amp electric motor. There are some really solid advantages to an electric chainsaw that I need to mention. Since it’s electric you will find they start up with no dramas at all, and in most cases it won’t matter if they have been sitting there for a year. They will still start up with no issues, which is true of this Greenworks chainsaw which starts up with no issues. I love electric chainsaws for the fact they require a lot less maintenance then a gas powered unit since you don’t have to deal with a gas engine. Which if you own this chainsaw for just trimming branches, I feel is a good thing you won’t need to spend hours looking after something you won’t be using for that long. 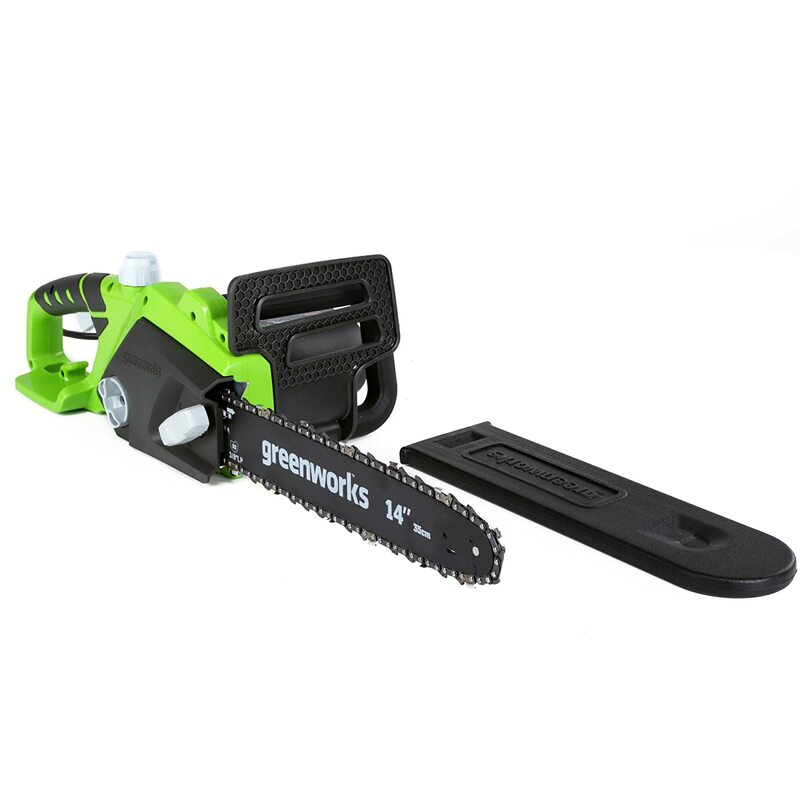 What Makes The GreenWorks A Good At Home Use Chainsaw? But where this unit really excels is trimming and cutting branches from household trees. While also having the capabilities of felling really small trees. It surprised me with just how quick of a unit it was when it cut through a tree trunk that was 12 inches wide. It took less than a minute even tho it was about 2 inches off the ground. Both of these feats were quite impressive since that is quite strong and quick and not something that I expected this chainsaw to actually do. But I will say that this chainsaw felt a lot better to use when it was cutting through 5 inch tree trunks and branches. It didn’t take very long and it felt a lot more comfortable at that size. One of the things that make this chainsaw really great for all the small jobs apart from its plug and play function, is that it is a very light chainsaw. It only weighs around 8 lbs, so it isn’t very heavy at all which makes it easy to lift and reach the higher place you will need to cut. Being so light also makes it excellent for seniors who need to do a bit of trimming who may not be able to lift as much. For such an inexpensive unit it was able to cut through a few larger trees then I expected, which really made it hard to not put on this list. It is an excellent chainsaw for people who have never used a chainsaw before, and gives great instructions on how to maintain this unit. Its light weight made it excellent to cut things that were up high, and didn’t feel to heavy after using it for a few hours. The Auto-Oiler was extremely useful and took the chore out of having to oil the chain and bar manually, which is apart of the small amount of maintenance you will need to do on this machine. 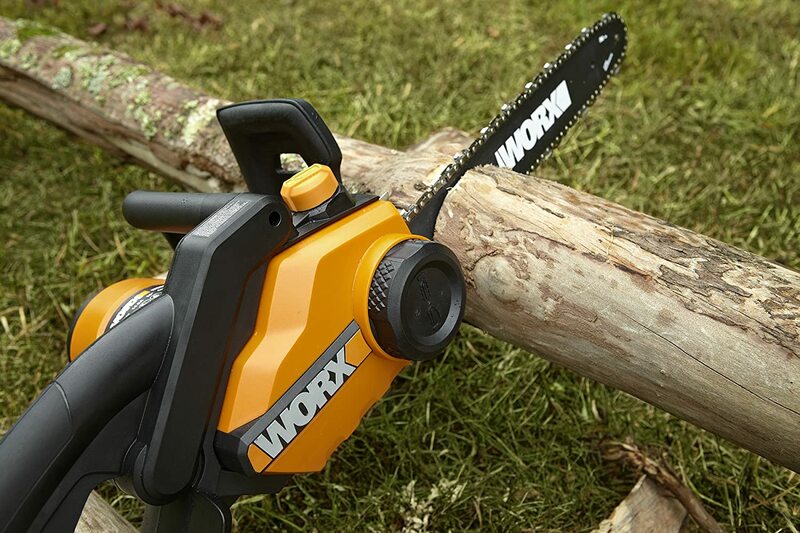 The Worx 16 inch electric chainsaw is quite a powerful unit that has a 14.5 amp electric motor which is what gives it the power it will need to get through most small jobs and even a few medium tasks. This chainsaw got through tree limbs that were 8 inches in diameter with little to no trouble at all, which makes it excellent for people who have some slightly larger trees around there yard. The thing that really impressed me tho is how it managed to cut through a 18 inch in diameter trunk of an ash tree. With very little effort. However, this is when I noticed the first problem I had with this chainsaw. This chainsaw is quite thirsty with its chain lube, but I found it was because of the lube that comes with the chainsaw. Once I changed over to a commercial bar and chain oil that had similar consistency of regular 30-weight motor oil this issue ceased to be an issue. There is one feature of this chainsaw that really makes it stand out from some of the other electric chainsaws, and makes it really useful for a home owner. The Worx comes with a auto-tension chain system which will help prevent over tightening, which is extremely useful for first timers and professionals alike. This makes the chain stay at the right tension for a lot longer then the average chainsaw. Although I do wish that Worx would make the chain adjuster knob a bit smaller, since it has a tendency to loosen by rolling against the wood you’re cutting. This is only an issue when you’re cutting in a tight position so it shouldn’t be a massive issue for most people. This chainsaw has very little kick back which is extremely useful if you’re not use to operating a chainsaw. This is thanks to its low kickback bar and it also comes with a built in chain break which makes it really safe to use. The brake shield that this unit has is really effective that the slightest bit of pressure will cause the saw to stop dead, so it is safe and easy to prevent kickback. Tho you will need to be slightly more focused on the brake since it can be very sensitive, which isn’t a deal breaker but something you should be careful of when operating this chainsaw. This chainsaw was able to get through some pretty solid trees and branches that I didn’t expect, especially the 18 inch tree trunk. The auto-tension chain system was a nice surprise that really stood out to me, it just worked so well and made cutting a quicker job since I didn’t have to readjust as often. I really like how little kickback this unit had, it makes it really helpful for people who are just starting out, or may not have the ability to prevent heavy kickback. At 11 lbs it is heavier then the unit above, but not enough to warrant it to be considered heavy by any stretch. Black+Decker are a highly respected name in the tool industry so I felt I couldn’t leave them off the list, but this chainsaw isn’t on here because of the brand power. 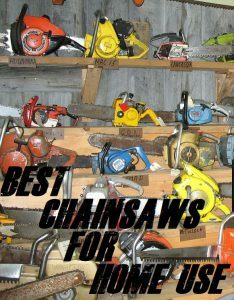 It made the list on its own merits and proved to me that it’s one of the best battery powered chainsaw on the market. The obvious advantage of having a battery powered chainsaw is you no longer need to have to worry about having extension leads everywhere. But now you have to make sure your battery is charged for when you want to use your chainsaw, which can be a little annoying if you forget about such things. But I found that the 40V MAX lithium ion battery help quite a bit of charge that lasted a lot longer then I was expecting. Since this Black+Decker has a 12 inch bar it is designed for cutting through massive tress and logs with a fair bit of power behind it. While I feel it is best suited to limbs and small trees that are 4-6 inches in diameter, it was still able to get through some larger trees. It was able to get through a tree that was 12 inches in diameter, these were cottonwood trees. The reason I wouldn’t recommend on going with this unit if you’re planning on going through larger logs, apart from the size of the bar. Is that the battery while it holds a lot of energy for its size, it will still only last over an hour when it’s fully charged. One thing that I really like about this chainsaw is that it has a tool free chain tension system which I find is a really nice quality of life improvement. I can’t tell you how long I’ve been looking for the right tool for some chainsaws, and getting frustrated I can’t find it. This isn’t an issue with this chainsaw, which is something I really like. Since this is a battery powered chainsaw there is one or two things I need to mention, and they may help you make your decision on if this is right for you. Battery powered chainsaws are more expensive so if you’re on a budget this might not suit you, and you will need to consider if the benefits of battery powered is worth it for you. The other thing is a personal recommendation is that if you do go with a battery powered unit, then I would recommend on having two batteries and rotate them. This isn’t always available, but it works really well if you have other Black+Decker tools that use the same type of battery. While I like electric chainsaws, I find not having to worry about extension leads to operate it extremely valuable. Not having to worry about how far away I was away from a power point was great. It has very low kickback and this is thanks to its Oregon low kickback bar and chain, again making it really useful for people who don’t have the ability to prevent kickback. Being able to run this battery powered chainsaw for just over an hour I found was plenty of time for the cutting tasks this chainsaw was designed for. If you’re planning on felling large trees then you will need something larger. It only weighs about 10.4 lbs so it is very maneuverable since it is so lite, and even more so since you have no cord to be worrying about. When I first got this chainsaw I was unsure about the brand Poulan, but after some research and finding out they’re from Sweden my worries started to lessen. Considering just how many trees with the amount of people that rely on wood for heat in Sweden. Surely they know a thing or two about chainsaws. 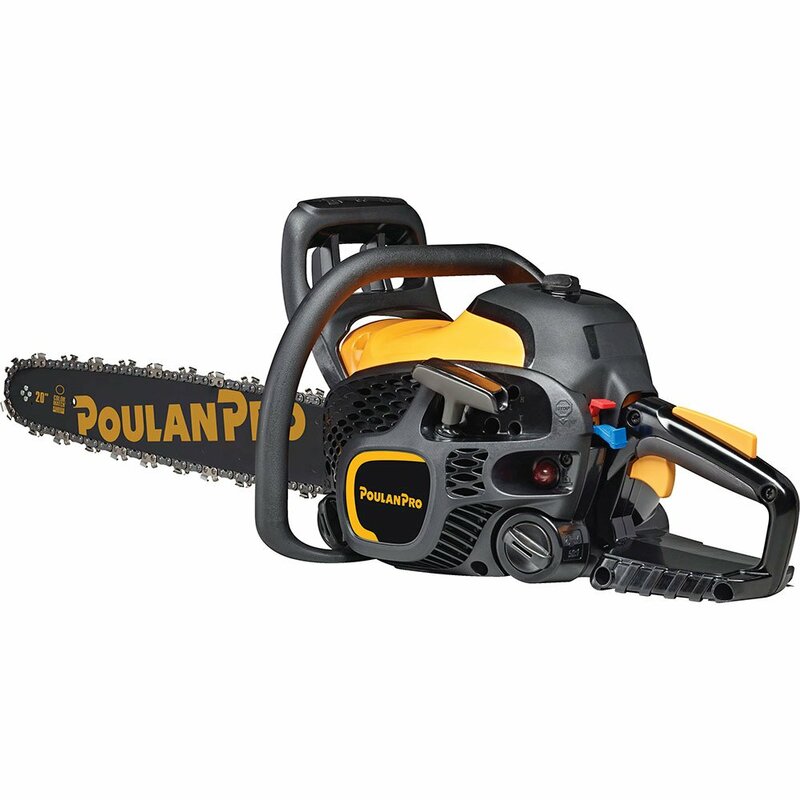 Which is true this Poulan Pro 20 inch gas chainsaw. It’s a beast of a chainsaw for its price. With this unit you won’t be forced to spend $300 plus which is what you will get if you look at something like a Husqvarna or Dewalt, which is what you’d expect with those brands. But for the average home owner who needs something a little more heavy duty, the Pouland pro will provide exactly what you need but on a budget. This chainsaw comes with a powerful 50cc 2 stroke gas engine that gives it plenty of power. I found it to be surprisingly easy to start, even in the cold. While this is a powerful chainsaw, the Pouland Pro is still a home owner grade unit, so you won’t be taking down the largest trees and limbs out there. In saying that, it will still get through some decent size trees. It is able to handle any of the limbs and trees the other units on this list, but it handles the larger trees and limbs a lot better and didn’t struggle like some of the others did. Even when running this chainsaw through about 500 lbs of tree limbs that were all about 10 inches in diameter, this chainsaw performed really well. One thing I have read a lot about with this chainsaw is that it has difficulty starting after your first time. Which is one of the most common issues most people have. A big thing I found was people weren’t reading the instructions properly which is pretty normal human error it seems nowadays. But there is a warning about Poulan chainsaws and that is they do have a tendency to flood, so if it’s not starting and you followed the instructions there is a possibility it has flooded. This makes sense when you find out how you have to start this unit. You have to press the plastic bulb at the bottom of the unit 10 times, then you pull the choke all the way, then you need to pull the cord 5 times, push the choke back in half way, then you need to pull the cord until it starts, let it run for 30 seconds, then you press the trigger to pop the choke off, and then proceed to let it idle. I’m not going to lie that is a lot to remember on your first few tries and can get a bit frustrating after awhile. For a gas powered chainsaw it did start easily after you have learned how to do all the steps, it also has a sticker on the bottom telling you the steps so you won’t forget. The 20 inch bar made it really useful for when I did decide to tackle larger logs and trees, which this chainsaw was able to get through. While it is the heaviest chainsaw on this list I never found its weight was to heavy, but since it has a gas engine that does make it heavier weighing at 17 lbs. I did like the fact that Poulan provided a case for this chainsaw, which you should get for any chainsaw you own, but I like how it was included with this unit. Personally I really like all 4 of these tools, they are all very reliable and give a lot of power for who they are intended for. The thing to remember is that these chainsaws are for the average home owner, and not someone who is looking for a tool to use at work everyday. Each type of chainsaw is appropriate to different kinds of people. For example, in an apartment block with very minimal shrubbery, a battery or electric chainsaw would be better suited. But for a home owner ling o a large block of land with more trees that you care to count, then a gas powered model is hands down the best to buy. If you’re looking for that you will have to spend a bit more money then what any of these units will cost. Tho I find these chainsaws are really good if you’re looking to make some firewood that you will then split with a log splitter. But apart from that they are excellent for the small jobs around the yard or property and I hope you found the right tool for the job here.